826 pages | 82 Color Illus. | 146 B/W Illus. 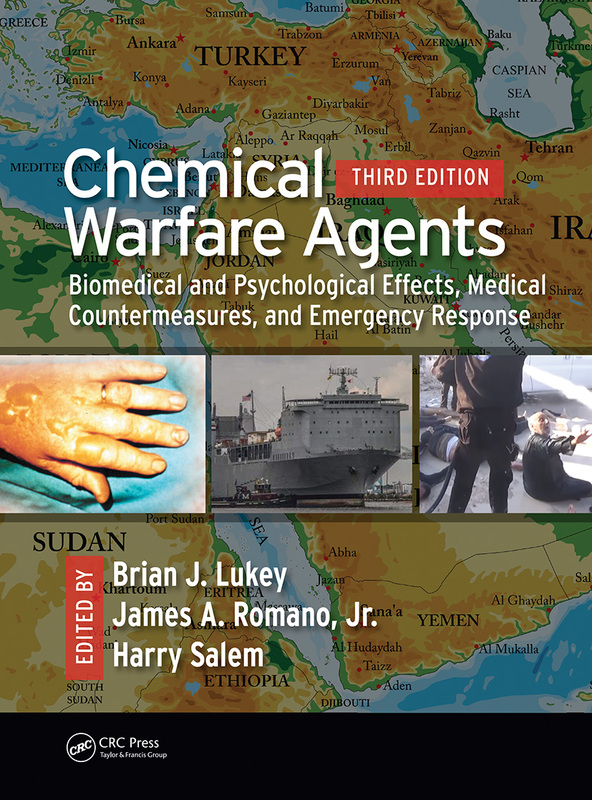 The third edition contains the most up-to-date and comprehensive coverage of the question of chemical warfare agent employment on the battlefield or in terrorism. Edited by workers that have been in the field for 35+ years, it remains faithful to the scientific "constants," while evaluating and crediting the advances by the industry that have made us safer. Section I: General. 1. Brief History and Use of Chemical Warfare Agents in Warfare and Terrorism. 2. Chemistries of Chemical Warfare Agents. 3. Toxicokinetics of Nerve Agents. 4. Organization for the Prohibition of Chemical Weapons (OPCW): History, Mission, and Accomplishments. 5. Chemical Holdings and Their Internationally Verified Destruction. 6. Syria's Chemical Disposal Program. 7. The Use of Chemical Warfare Agents during the Syrian Civil War. 8. U.S. CBRN Homeland Response and Civil Support. Section II: Agent Effects. 9. Mustard Vesicants. 10. Health and Psychological Effects of Low-Level Exposure to Chemical Warfare Nerve Agents. 11. Inhalation Toxicology of Chemical Agents. 12. Cyanides: Toxicology, Clinical Presentation, and Medical Management. 13. The Structural Biology, Biochemistry, Toxicology, and Military Use of the Ricin Toxin and the Associated Treatments and Medical Countermeasures for Ricin Exposure. 14. Medical Countermeasures for Intoxication by Botulinum Neurotoxin. 15. Incapacitating Agents and Technologies: A Review. 16. Screening Smokes: Applications, Toxicology, Clinical Considerations, and Medical Management. Section III: Protection. 17. Personal Protective Equipment (PPE): Practical and Theoretical Considerations. 18. Pyridostigmine Protection from Nerve Agent Intoxication: Concept to FDA Approval. 19. Hormesis: Using Preconditioning to Build Biological Shields - A Novel Approach for Enhancing Resilience to Toxic Agents, Traumatic Illness/Injury, and Age-Related Degenerative Diseases. Section IV: Detection. 20. Clinical Detection of Exposure to Chemical Warfare Agents. 21. Biomarkers for Organophosphate Poisoning: Physiological and Pathological Responses. 22. Field Sensors: Military and Civilian. 23. Application of Genomic, Proteomic, and Metabolomic Technologies to the Development of Countermeasures against Chemical Warfare Agents. 24. Nanomaterial-Based Sensors: Applications in Chemical Warfare Agent Detection and Identification. Section V: Decontamination. 25. Chemical Warfare Agent Decontamination from Skin. 26. Aircraft Decontamination and Mitigation. Section VI: Treatment. 27. Military Chemical Casualty Treatment. 28. Pre-Hospital and Hospital Response to Toxicological Mass Casualty Events: The Israeli Approach. 29. An Overview of the NIAID/NIH Chemical Medical Countermeasures Product Research and Development Program. 30. Medical Management of Chemical Warfare Agents. 31. Protein-Based Bioscavengers of Organophosphorus Nerve Agents. 32. Oxime Research. 33. Brain-Penetrating Reactivators of Organophosphate-Inhibited Acetylcholinesterase. 34. Nerve Agent-Induced Seizures and Status Epilepticus: Neuroprotective Strategies. Section VII: Predictive Modeling. 35. Computational Modeling to Predict Human Toxcitiy. 36. Lung-on-a-Chip. 37. Body-on-a-Chip for Pharmacology and Toxicology. 38. Animal Models. 39. Real-Time Physiological Data Collection and Analysis in Animal Inhalation Models: Predictive and Diagnostic Implications. 40. Contextual Factors Influencing Leadership Decision Making. Col (retired) Brian J. Lukey, PhD, is currently a senior civilian toxicologist for the U.S. Air Force, Wright-Patterson Air Force Base. Due to the nature of a military career, he has had numerous assignments in a variety of areas of medical research. These include managing programs directed toward medical chemical warfare defense, forensic toxicology for drugs of abuse, occupational and environmental health analytical procedures, and military operational medicine. He has authored and coauthored more than 45 manuscripts and technical reports, and is the codeveloper of one patent. Dr. Lukey is a highly decorated military officer, having been awarded the prestigious Medical Service Corps Award of Excellence, two Legion of Merits, and multiple Meritorious Service Medals, Army Commendation Medals, and Army Achievement Medals. He is a member of the Order of Military Medical Merit and wears the Expert Field Medical Badge, Airborne Badge, Air Assault Badge, and German Troop Duty Proficiency Badge. James A. Romano, Jr., PhD, was an instructor of psychology at Manhattan College, Bronx, New York, from 1970 to 1975. Awarded tenure in 1976, from 1976 until 1978, he was an assistant professor of psychology at Manhattan College. He entered the U.S. Army in 1978, and progressed as a scientist and manager into positions of increasingly greater responsibility to include commander, U.S. Army Medical Research Institute of Chemical Defense (2000–2003), Aberdeen Proving Ground, Maryland, and deputy commander of the U.S. Army Medical Research and Material Command, Fort Detrick, Maryland, his position at retirement from the U.S. Army. He then joined Science Applications International Corporation as a senior principal life scientist in the fall of 2006. In his research, he focused on the neurotoxicological effects of chemical warfare agents and medical countermeasures to these agents. Dr. Romano is the author of more than 100 papers in the areas of medical chemical defense and two successful textbooks: Chemical Warfare Agents: Toxicity at Low Levels (CRC Press, 2001) and Pharmacological Perspectives of Toxic Chemicals and Their Antidotes (Springer-Verlag, 2004). He currently serves on the Homeland Security Subcommittee to the Environmental Protection Agency’s Board of Scientific Counselors. Harry Salem, PhD, is chief scientist for Life Sciences at the U.S. Army Edgewood Chemical Biological Center, Aberdeen Proving Ground, Maryland. Edgewood Chemical Biological Center is a U.S. Army Research, Development, and Engineering Command Laboratory and is the Army’s principal research and development center for chemical and biological defense technology, engineering, and field operations. Edgewood Chemical Biological Center has achieved major technological advances for the warfighter and for our national defense, with a long and distinguished history of providing the Armed Forces with quality systems and outstanding customer service. Dr. Salem was previously the chief of the Toxicology Division and also the acting senior team leader for Biosciences at Edgewood. Prior to that, he was employed in positions of increasing complexity and responsibility by the pharmaceutical and contract laboratory industries. His research interests and experience include inhalation and general pharmacology and toxicology, and in vitro and molecular toxicology. He has served in adjunct positions at the University of Pennsylvania, Temple University, Drexel University, and the University of Maryland, and continues to be active as a visiting professor at Rutgers University. He has been on the editorial boards of several professional journals and has served as editor-in-chief of the Journal of Applied Toxicology for over 20 years. He has published 18 books, including three volumes of the International Encyclopedia of Pharmacology and Therapeutics, which he coauthored, as well as over 100 papers in scientific journals and chapters in books. In 2001, Dr. Salem was awarded the Society of Toxicology Congressional Science Fellowship, and he served as a science advisor to Congressman Jim Greenwood. He became a Fellow of the Royal Society of Chemistry in 2015, and was president of the Stem Cell Specialty Section of the Society of Toxicology in 2017–2018.